The sky Dec. 10 at 7:30 a.m. from midnorthern latitudes. Most skywatchers will want to try and spot the trio a little earlier under darker skies. But you'll need a clear view of the horizon. Jupiter, Mercury and Mars are destined in the coming days to crowd into a small spot in the sky, making for a most intriguing gathering very low in the east-southeast sky. A wide variety of different conjunctions and configurations involving the planets typically occur during the course of any given year. It is rather unusual, however, when three or more bright planets appear to reside in the same small area of the sky. From our Earthly vantagepoint, we can readily observe Mercury, Venus, Mars, Jupiter and Saturn with our unaided eyes as they revolve around the Sun. Each of these planets appears to move against the starry background at their own speeds and along their own tracks. It is obvious that since they are constantly moving at different speed, the positions of all five planets at any particular time is unique to that particular moment. Jean Meeus of Belgium, recognized as a world authority in spherical and mathematical astronomy, has defined the term "planetary trio" as when three planets fit within a circle with a minimum diameter smaller than 5 degrees. Your clinched fist held at arm's length, for instance, is equal to roughly 10 degrees; the pointer stars at the end of the bowl of the Big Dipper are separated by just over five degrees). "That limit of 5 degrees has been chosen more or less arbitrarily," notes Meeus, "but we have to make a choice." Between Dec. 7 and 14, the planets Jupiter (magnitude -1.7), Mercury (-0.6) and Mars (+1.5) will fit within a 5-degree circle [Sky Map]. The best time to look for them will be around 6:30 a.m. local standard time. At that hour, they will be hovering very low over the east-southeast horizon in the brightening dawn twilight. Unfortunately, their low altitude, plus this gathering's proximity to the Sun will probably render Mars invisible (or nearly so) to the unaided eye. So I would strongly recommend that you use binoculars if you have any hopes of seeing it. In contrast, Mercury and Jupiter should be readily visible to the eye with only slight difficulty, as they respectively will appear about 3 and 19 times brighter than Mars. Each morning you'll be able to watch how these three worlds change their positions relative to each other. The trio will be most compact-fitting within a 1-degree circle-on Dec. 10. On this morning, before sunrise, the three planets will resemble a compact arrowhead pointing west, with Mars at the arrowpoint. Through this 7-day interval there will also be separate conjunctions between Mercury and Mars (1.0-degree apart on Dec. 9), Mercury and Jupiter (only 0.1-degree apart on December 10th) and Mars and Jupiter (0.8-degree apart on Dec. 11). Also, for binocular viewers on the morning of Dec. 10, Mercury will lie just 0.15-degree below and to the right of the +2.5 magnitude star Graffias in Scorpius, the Scorpion. In some older star books, Graffias is sometimes labeled as Akrab. It is generally regarded as one of finest double stars in the sky for small telescopes. I'll end this week's column with an answer to a question I suspect many might be asking at this point. Are planet trios rare events? The answer, which may be surprising to some, is, not really. In his research, Dr. Meeus compiled a listing of all the trios that occur during the interval from 1980 through 2050. He found 40, which translates to a frequency of one every 21 months on average. 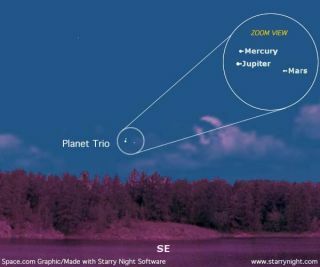 In fact, the last planet trio took place just 18 months ago and involved Mercury, Venus and Saturn. However, some of these trios are all but impossible to observe. A good example is one that occurred in September 2004 with Mercury, Mars and Jupiter. That trio convened only 5-degrees from the Sun and of course was invisible. What does make this trio special is that it is the most compact one in Dr. Meeus' list. Over that 70-year time span, there is no other case where three naked-eye planets converge to with less than one-degree of each other. The only planet trio that fits this criterion is the upcoming one on Dec. 10.